Angler Mountain Ranch in Silverthorne CO Real Estate is a new 192 acre development site with almost half the acreage dedicated to open space. 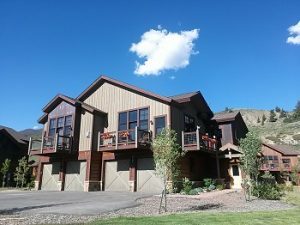 Angler Mountain Ranch consists of duplexes, triplexes, cabins, vacant lots and single family homes for sale in Silverthorne Colorado. Located steps from the Ptarmigan Trailhead, the White River National Forest and surrounding Open Space make these Silverthorne properties ideal for outdoor enthusiasts. Angler Mountain Ranch also has a 13-acre stocked lake with private fishing for property owners and is situated near the gold medal fishing waters of the Blue River. With views of Gore Range and the surrounding mountains, Angler Mountain Ranch is the ideal mountain getaway in Summit County Real Estate. Constructed and built by Compass Homes Development LLC, Angler Mountain Ranch has superb finishes including granite slab counters, knotty alder cabinets, doors and trim, patios and decks to take in the extensive views and more. Angler Mountain Ranch homeowner assocation dues vary based on the type of property and size but the duplexes and triplexes monthly dues include exterior maintenance, snow removal, trash pick-up and landscaping. When looking at Silverthorne Real Estate, take a look at the properties for sale in Angler Mountain Ranch – you won’t be disappointed.